The company was founded by Thomas Joseph Cantrell (1827-1909) who was born in Dublin. He moved to Belfast were he worked at a chemists. He established his own business with James Dyas manufacturing mineral waters, ginger ale, lemonade etc. In 1868 he merged with Henry Cochrane (1836-1904) and founded Cantrell & Cochrane. By the 1880s they were described as the largest soft drinks manufacturer in the world. 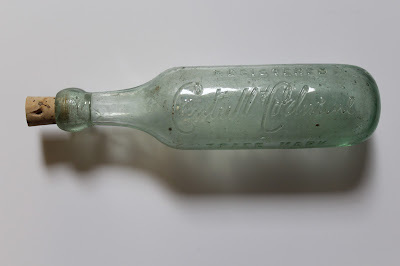 The round bottomed bottles were made from 1869 until the early 1900s. Because the bottle lay on its side the cork stayed moist and didn't dry out. Ginger ale, seltzer water, and medicated aerated water were sold in this type of bottle.